One wing of the Coatham Hotel was never completed in the style of the rest of the building and the Windsor Ballroom was added some time between 1955 and 1961 (see discussion in comments). 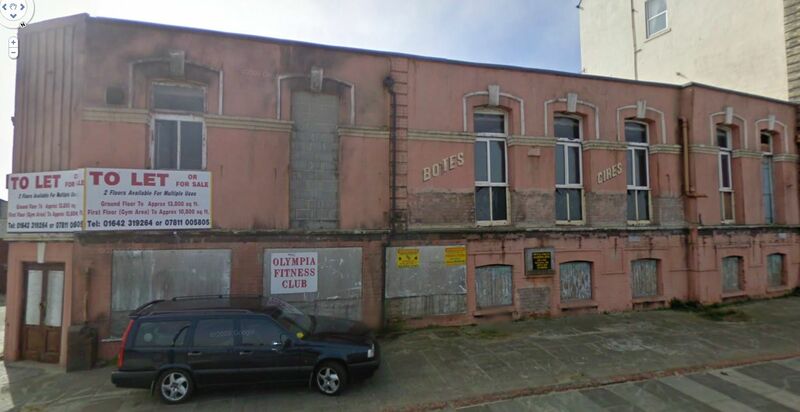 In later years it became a nightclub and a gym. The building has remained derelict since with its French set-decorations still on display, until August 2011 when its been given a fresh coat of paint and is now covered. THE COATHAM HOTEL AND WINDSOR BALLROOM…. A discussion about the Coatham Hotel Ballroom and the extension of the Windsor Ballroom “at a later date”. I learn’t to dance in the Hotel Ballroom in the late 1940’s (47 to 49) but my memory of the Windsor Ballroom stems only from the 1950’s, and to settle an augument. When was it actually built? The RAF Headquarters was in the hotel, with basic training taking place along the length of the promanade during the early part of WWII. I remember it well as a young boy at Sir William Turners Grammar School. I don’t know myself, but i’ll put some feelers out for an answer. Thanks. I did think of Vera Robinson but I don’t know if she has e-mail. I was brought up in William Street opposite where Vera lived at that time. It took several years to build the Windsor Ballroom as an extention to the hoptel. Rumour was that Charlie Amer used his bandsmen in their spare time as brickies and labourers. I remember playing around the part-built shell until we moved from Queen Street when I was 11. So it was not functioning before 1955. It was however fully operational by the time I was at college in 1961 when many Old Coathamians used to converge on the Jazz Club every weekend. That gives you a window of 1955-61. Can anyone narrow it down further? Have you managed any further information? I currently live in the coatham hotel and i’m quite interested in the building however all the information i find seems to contradict the last thing i found out about the place, after searching on the internet i managed to find some images of the building from various years. There is an image i have found, looking at the car in the image must be somewhere between 1920 and 1940 this image also shows an extension on the side of the building with a sign saying “Palais de Danse” so this goes against what oyu were saying about it being built sometime in the late 50’s. If you provide me with an email address i’ll forward you the images i have found. You’ll also have to excuse me if i’m talking about a previous building that was in that location, i know very little about this building but i would like to know! my late father took over the building in 1988, the building was renovated with the help of a grant from the camerons brewery in hartlepool. The building was valued at a mere £100,000 in 1990 when my father tried to buy it, from the then current owners from london. I worked there during the renovation and until 1993 which is when the hotel was struggling to fill the rooms, the ballroom was then used to host weddings parties was part of the jazz festival. I did look into some of the history back then, the building was completed in 1870, the left of the building was started but never completed due to the owner/ builder running out of cash. Capones was opened in 1989 and was a bar themed on the 1940/50’s gangster era. I worked in the coatham hotel early 1970’s,ithink iwas the last bar celler man the managers then were m,gregor before clive Emmerson took over.then the hotel was owend by Scottish & Newcastle breweries and sold to british steel t be used as offices the bar bellow was called the grotto bar .at the other end the round corner was called the lantern loft it was a very happy place to work.